This petition will force the FBI Director who is responsible for an honest investigation of the scientific evidence that proves explosives were pre-planted in the twin towers and detonated before the planes struck the two buildings on 9/11/01 to actually do the job "we the people" pay him to do. If this petition is successful, the next petition, Pogo Petition - 20070002, will force the CDC, FDA and NIH to review the scientific evidence that proves that our insane, profit-driven, government-promoted vaccination policies are the major cause of the autism epidemic of 1 in 150 school age children according to the CDC. I am asking all Vaccination Liberation and Autism Action Advocates to sign this petition in order that our goal of 1,000 petitioners can be met. As of 10/15/07, approximately 150 members of the 911 Truth Movement have signed this petition. Donald Meserlian, P.E., Chairman of Voices of Safety International (VOSI), has scientific evidence that vaccinations are responsible for 80% of the autism epidemic; 18% caused by mercury (Thimerosal preservative in vaccines) and 62% the triple vaccines MMR and DPT. See www.voicesofsafety.com ..."Public Health". ... Don has a 42 year old son who became autistic after receiving the DPT shot at age 2. Don will be 80 on November 4th and has said the best birthday gift he could receive would be achieving his goal of a minimum 1,000 people willing to sign his petition to the FBI. As director of Vaccination Liberation, I support Pogo Petition 20070001 and am asking all VacLib members and friends to send this petition ASAP. THIS IS A RED ALERT, THIS BILL IS PROPOSING HEALTH CARE COVERAGE FOR AUTISM SPECTRUM DISORDERS. THIS IS THE LEGISLATION WE HAVE BEEN WAITING FOR. THE BILL WAS JUST PROPOSED BY LUCIO IN THE STATE SENATE. IT HAS NOT BEEN ASSIGNED TO COMMITTEE, WE MUST FIGHT AND PUSH TO HAVE THIS PASSED THROUGH COMMITTEE AND THEN SENATE AND HOUSE FOR THE GOVERNOR TO SIGN. MAKE NO MISTAKE, THE POWERFUL INSURANCE INDUSTRY AND OTHERS WILL TRY TO TABLE THIS BILL IN COMMITTEE, OR KILL IT ON THE FLOOR. WE MUST NOT ALLOW THIS TO HAPPEN, TIME IS OF THE ESSENCE. REMEMBER, THE STATE LEGISLATURE ONLY CONVENES EVERY TWO YEARS. OUR CHILDREN CAN NOT WAIT FOR ANOTHER TWO YEARS FOR THIS TO HAPPEN, WE MUST MAKE THIS BILL PASS! PLEASE FORWARD THIS EMAIL TO EVERYONE IN THE AUTISM COMMUNITY, THE BILL IS ATTACHED. WE CAN MAKE THIS HAPPEN, BUT WE MUST DEMAND IT!!! Texas Govenor Rick Perry's Executive Order Mandating HPV Vaccine Carries No Force of Law! forward it to any contacts in Texas. against this sexually transmitted virus in order to attend the 6th grade! expressing your opposition is needed! forms must be notarized and repeatedly submitted every 2 years. by the legislature to reverse this and prevent it from happening again. to this shot if it is mandated. the administration of this vaccine. What Do We Really Know About the HPV Vaccine? typical risk factors affecting junior high girls. cervical cancer is very rare in women who get regular PAP tests. cervical cancer prevention by vaccinating preteen girls should be made. months of review. It has been on the market for less than 1 year. making the vaccine mandatory. "I think it's too early," said Joseph A. 3 HPV doses will be directly injected with 675 mcg of aluminum. of 3 shots. According to one of the authors of the bills filed, Sen.
their daughters on their own. The American Cancer Society, What Causes Cancer of the Cervix. The National Institutes for Health, National Cancer Institute. Diseases, Genital HPV Infection - CDC Fact Sheet. 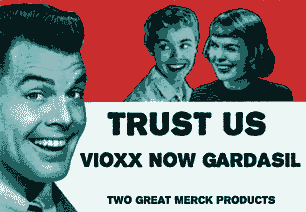 Gardasil package Insert. 2006. Page 1. Gardasil package Insert. 2006. Page 5, paragraph 6. Gardasil package Insert. 2006. Page 2, paragraph 2. October 26-27, 2005 ACIP meeting, p. 57. Stewart and Rob Stein. January 10, 2007, p. A01. The Baltimore Sun, "Drug Firm Pushes Vaccine Mandate, Merck Lobbies Md. On HPV Preventive. by Laura Smitherman, January 29, 2007.
by Susan Todd, January 23, 2007. Gardasil package Insert. 2006, Page 8, paragraph 17. Gardasil package Insert. 2006, Page 9, paragraph 1. Services Administration National Vaccine Injury Compensation Program. the way they raise their children. By using an executive order that bypassed the Legislature, Republican Gov. using embryonic cells, counts on the religious right for his political base. that protects children against polio. target and prevent cervical cancer," he said. failing to gain the support that they had expected." medical decisions for their children. adopt rules like this one. are likely to be sexually active. White Delisi, is a state director for Women in Government. introduced by members of Women in Government. spending on lobbyists or how much it has donated to Women in Government. This information is not to be construed as medical OR legal advice. Gardasil Mandates - News, etc. Billboards: Florida, Idaho, is your state next? Montana: Asking for the religious waiver for day-care.